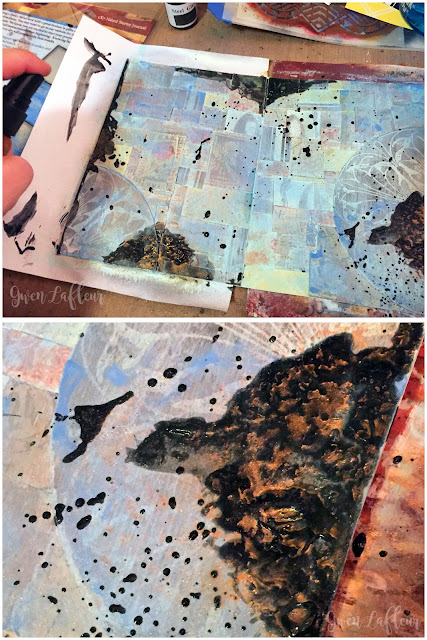 This month StencilGirl Products is collaborating with Canvas Corp Brands to show unique ways to combine StencilGirl stencils with a variety of Canvas Corp Brands surfaces and Tattered Angels Paint Kits, and I'm excited to get to participate via this month's edition of Gwen's Gems! 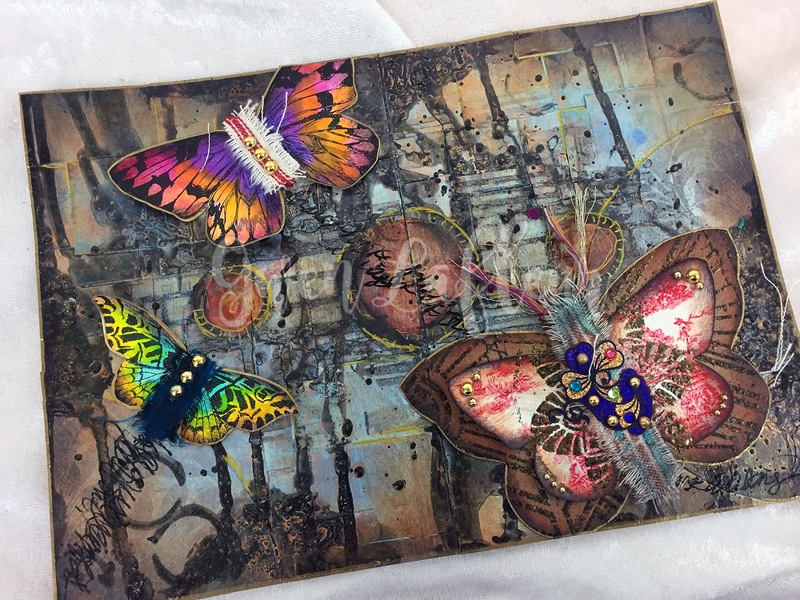 Be sure to check out the details at the end of this post on how you can win a prize package ​worth over $50 in goodies from StencilGirl Products and Canvas Corp Brands! 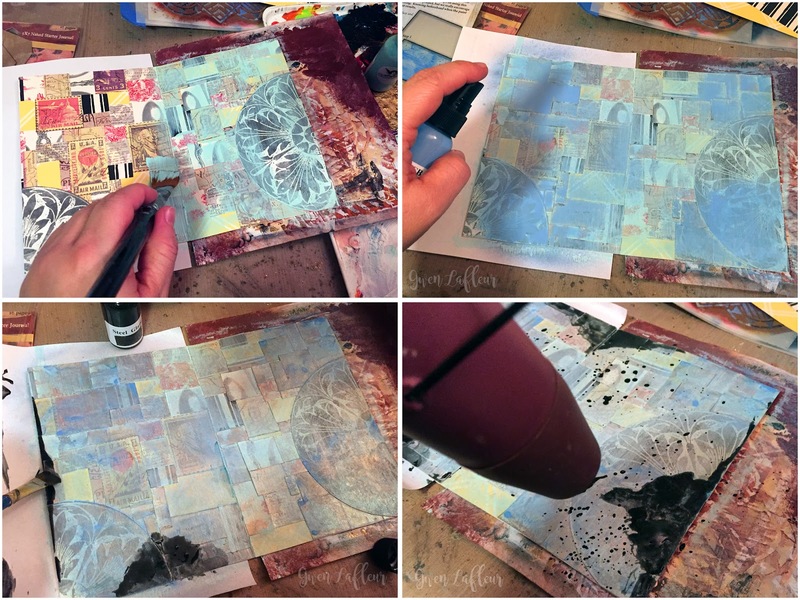 For my project this month I decided to make an art journal spread in the fabulous 5"x7" Ivory 7 Gypsies Naked Art Journal along with the Blue Rusty Metal Tattered Angels Paint kit, some of my new Art Deco stencils, and a few other goodies Canvas Corp Brands. 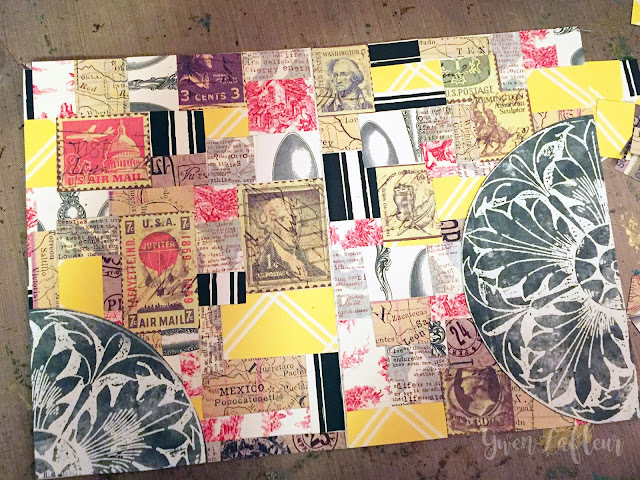 To start, I opened to a fresh spread in the journal and took a bunch of patterned papers and turned them into a patchwork background using a technique I learned in a class with Seth Apter. 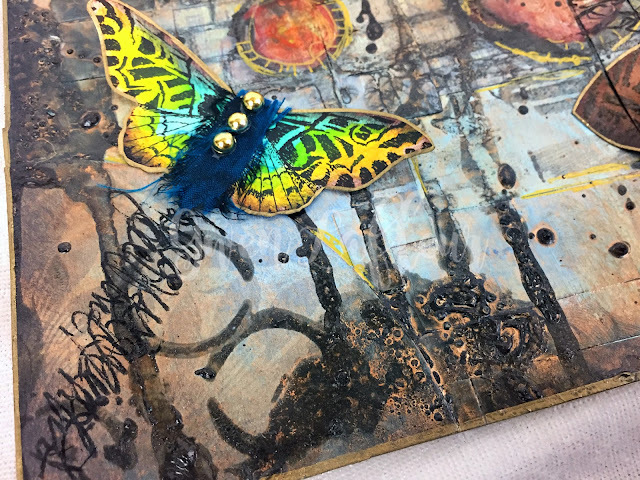 Next, I took my Tattered Angels paint kit and followed the instructions inside to paint and age the background. Here you can see the steps, starting with a light base coat and then adding pools of a darker blue paint spray. Above is a close-up of one of the aged spots on my page. Look how cool that is! Next, I went to stencil onto the background with some of the Glam paint... and accidentally dumped about 1/3 of the bottle onto my layout. As Carolyn Dube would say, it's an Outstanding Opportunity Presenting Suddenly! Or as my mom always said when I was growing up, "an artist always makes something of her mistakes." I still wanted a stenciled design in the center, so I took the same stencil I was going to use before - my Art Deco Bookplates stencil, and carefully laid it over the wet paint. 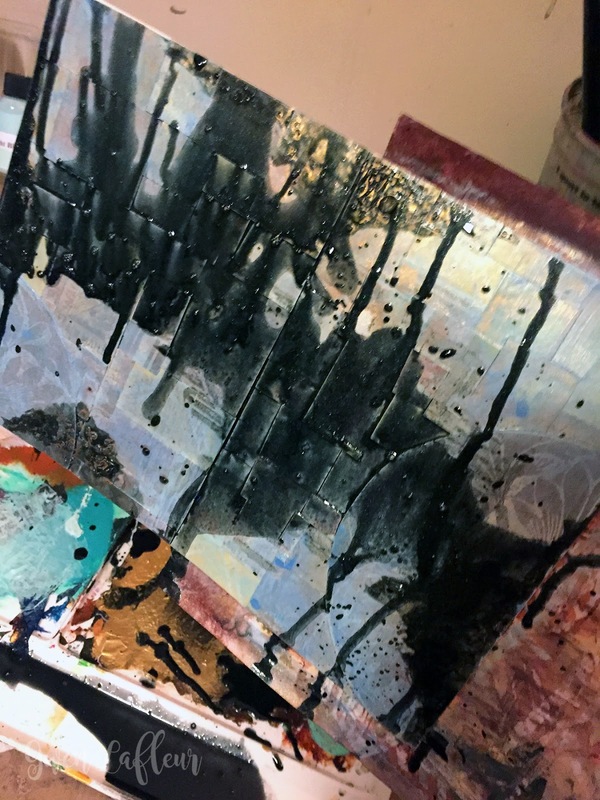 Then I just took a baby wipe and did some reduction stenciling - I wiped the wet paint off through the openings of the stencil. It worked! 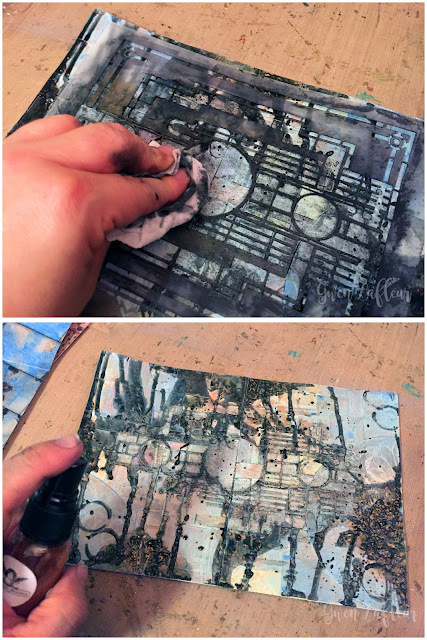 I used my heat gun again to bubble the paint that was still wet and then hit it with some more Glimmer Mist to get more of that fabulous rusting effect. Honestly? I loved it so much I almost stopped here. That was definitely not a mistake, it was serendipity! Of course, this is me so I didn't stop there. 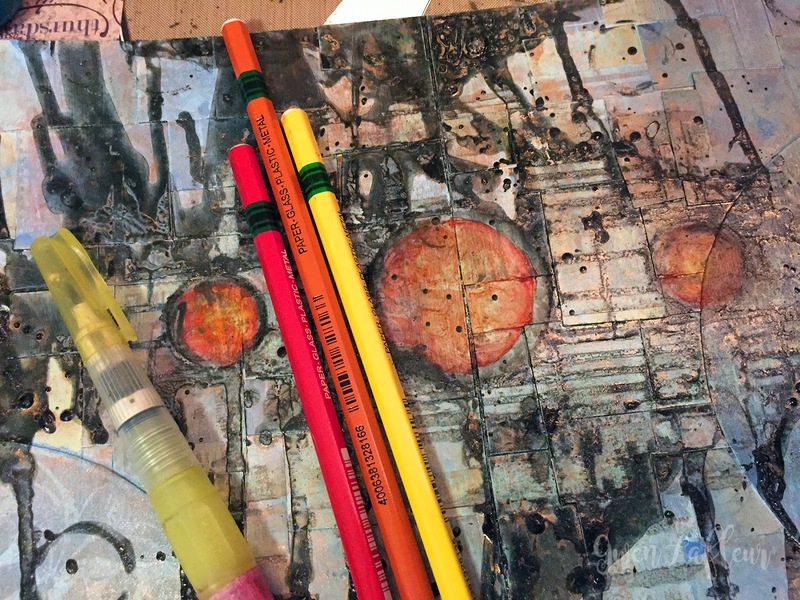 I wanted to echo the rusty color of the Glimmer Mist, so I used red, orange, and yellow Stabilo All pencils to color in the circle openings from the stencil. Next, time to embellish. 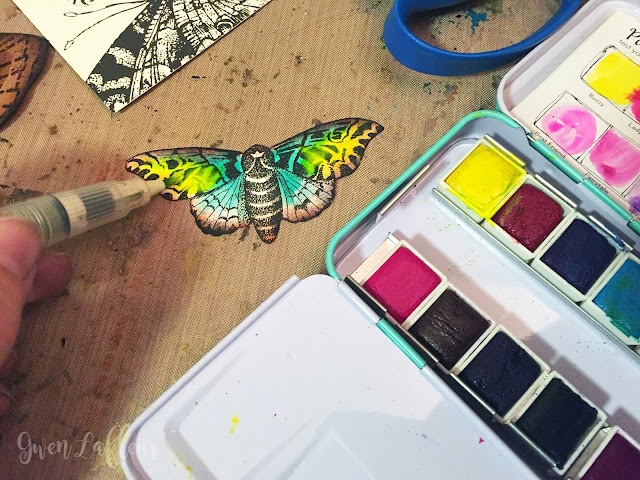 I had a piece of really cool butterfly patterned paper so I cut a few out and used one of them as the pattern to make a larger butterfly from kraft cardstock. 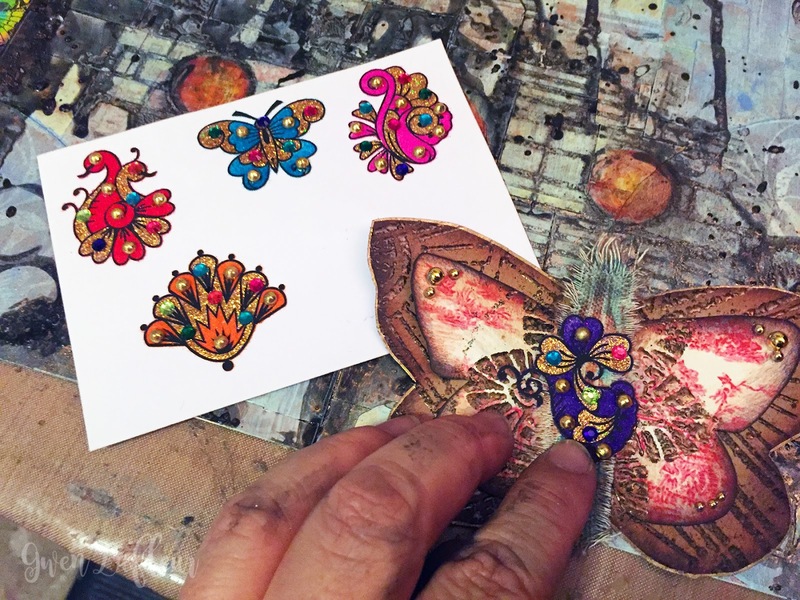 I stenciled that with my Art Deco Sunburst Background stencil and heat embossed it, then cut a smaller butterfly from some toile patterned paper and added some stenciling to that with my Art Deco Flower Medallion stencil and heat embossed that as well. I wanted to customize the body of the butterfly, so I took some Canvas Corp Canvas Fringe and tore off a section, then stenciled that with a section from my Art Deco Bookplates stencil and Sepia Archival Ink. I adhered everything together, inked the edges, added some self-adhesive flat backed gold beads, and then added a fun and funky self-adhesive tattoo from India. I added fabric centers to those and some more self-adhesive gold beads to tie them in with the larger butterfly, then adhered everything onto the background. 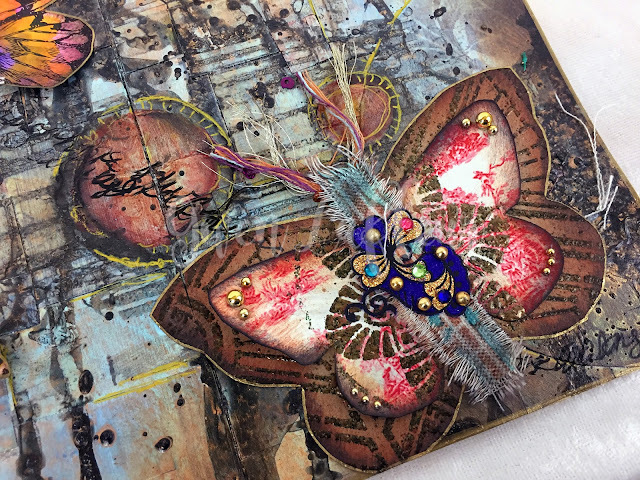 Finally, it's a journal, so I added some journaling as the trailing flight lines from my butterflies. I edged the spread with a gold paint pen and added a few gold lines here and there on the background, and it was done! I hope you enjoyed today's project and tutorial! Now, of course, what would a matchup be without a fun giveaway? Here’s your chance to get your hands on a products from both ​StencilGirl Products and Canvas Corp Brands! 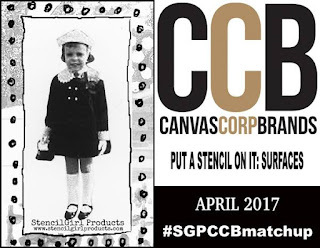 leave a comment here on any or all of the Match-up Posts during the month of April with StencilGirl Products and CCB. You can leave one on each post for more chances to win. Don’t forget to include the hashtag #SGPCCBmatchup so we can find you!!! and/or leave a comment on the CCB Facebook page or StencilGirl Products Facebook page. Don’t forget to include #SGPCCBmatchup so we can find you!!! and/or leave a comment on any of the CCB Instagram posts or StencilGirl Products Instagram posts where you see any of the projects from the CCB team or the SGP team. Don’t forget to include #SGPCCBmatchup so we can find you!!! 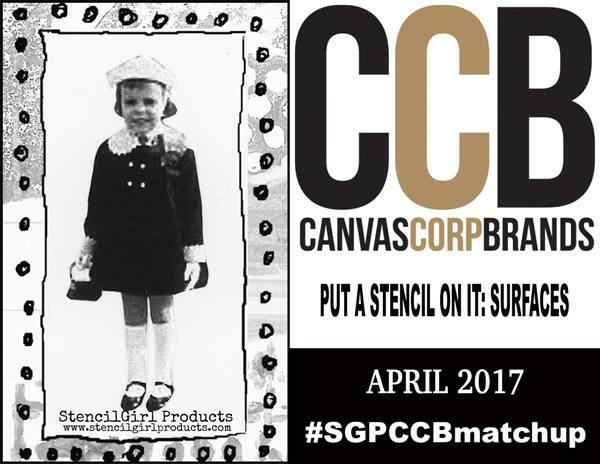 You can follow along by searching #SGPCCBmatchup. 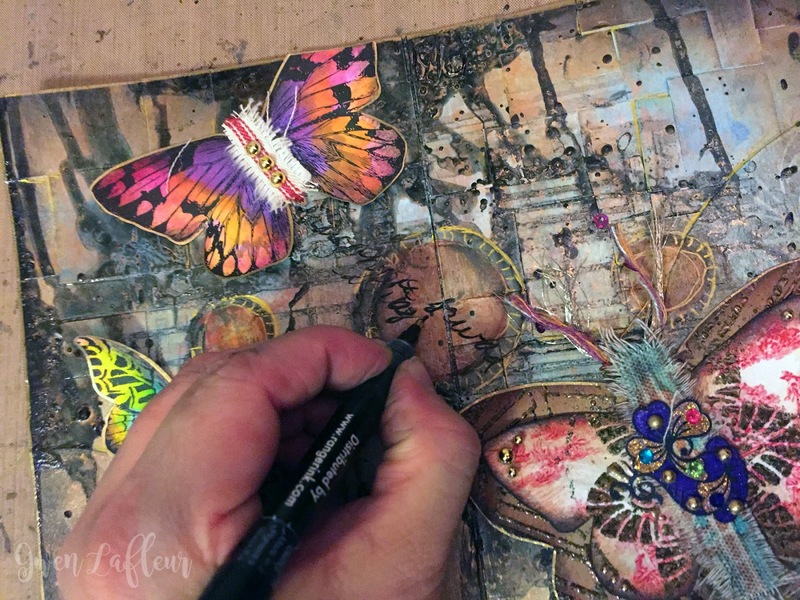 If you love what you see and would like to join the Facebook group CCBCollective – ask to join today. We will be sharing projects the entire month of April – learn new techniques, see how new products are used and be inspired with great ideas from members of the SGP and CCB creative teams. 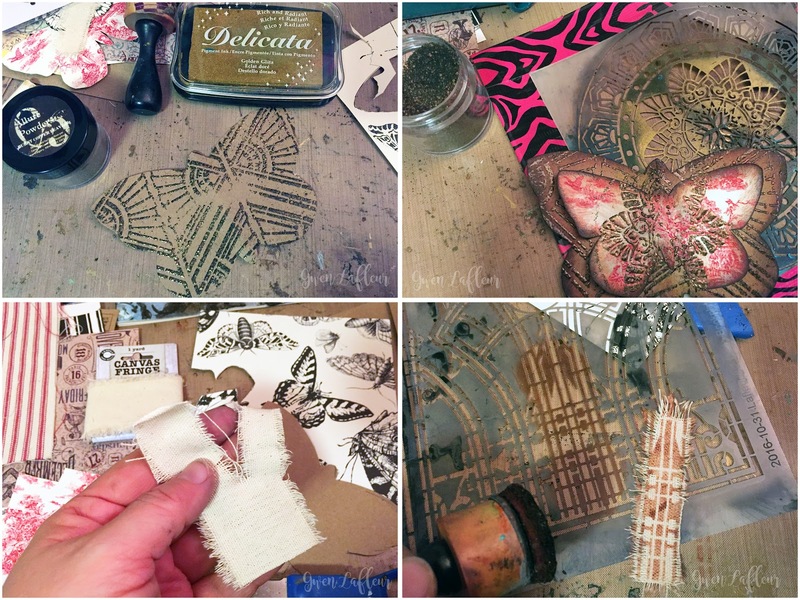 Good luck with the giveaway, and until next time... happy stenciling! Such lovely details and layers! 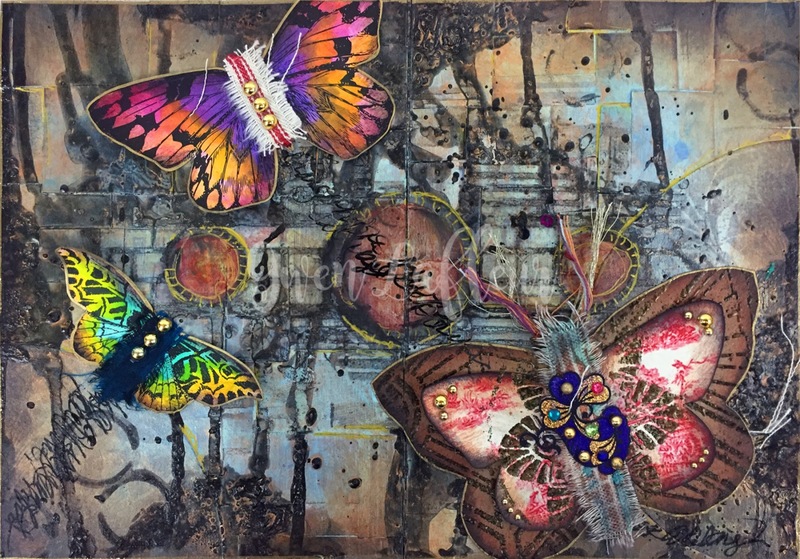 Ohhh the stencilling is amazing, just love the whole spread! Love this- great tutorial. I was constantly knocking over my bottles. After a spectacular Pomegranate Glimmer Mist spill started popping them into an empty $1 pencil holder size tin. I put it on my desk, anytime I open a bottle I pop it in the tin-no more spills!